After three days looking around the battlefields of Gallipoli today we’re heading to Istanbul. The bus loads of tourists were still coming in as we headed out of Eceabat along the coast. 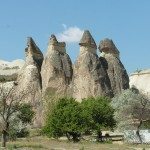 After talking to a local we discovered that during the summer holidays lots of people head to the Gallipoli peninsula from Istanbul, Çannakale, and Ankara on three day tours. 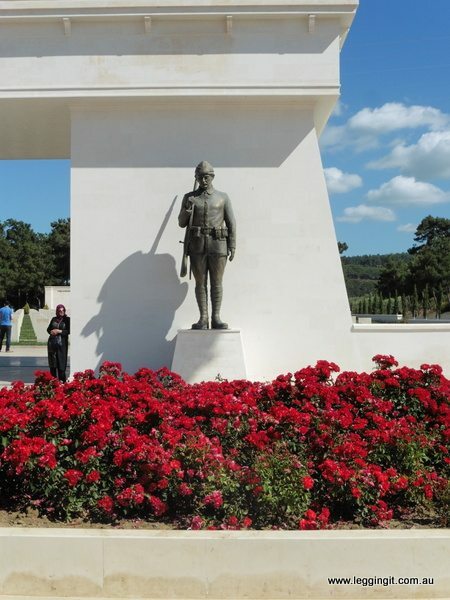 Not far from Gelibolu we stopped off at a big Turkish Cemetery. 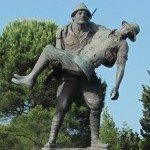 It had been situated near a hospital during the Gallipoli campaign where Turkish troops were sent to be stabilised before being ferried to the larger hospitals. Thousands who didn’t survive are buried here. 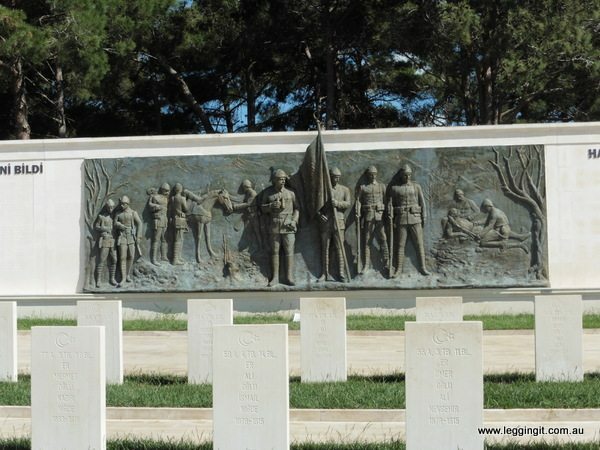 At the front of the cemetery two bronze statues of Turkish soldiers guard the monument and beyond the graves a bronze frieze commemorate those who fought. The Turks must love their brass because every Turkish cemetery had a souvenir stall sell brass souvenirs. Not long after arriving the buses arrived so we figured it was time to leave. The northern part of the Gallipoli peninsula is a patchwork of wheat fields and farmland. It’s quite a nice area to ride through. At our first stop we decided to pull into a Truck layby. As we were having a drink a cyclist riding a touring bike loaded up with panniers stopped, as he saw our GB plates and asked us if we were British. Of course we told him we were Australian. 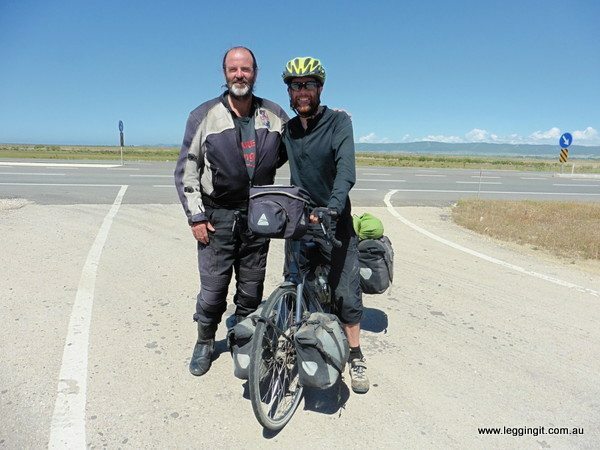 He introduced himself as Tim Snaith who was on an around the world bike tour His blog is The Unknown Around The Corner check out his journey. Whilst we were chatting he told us a bit about his travels including his visits to Australia and New Zealand. 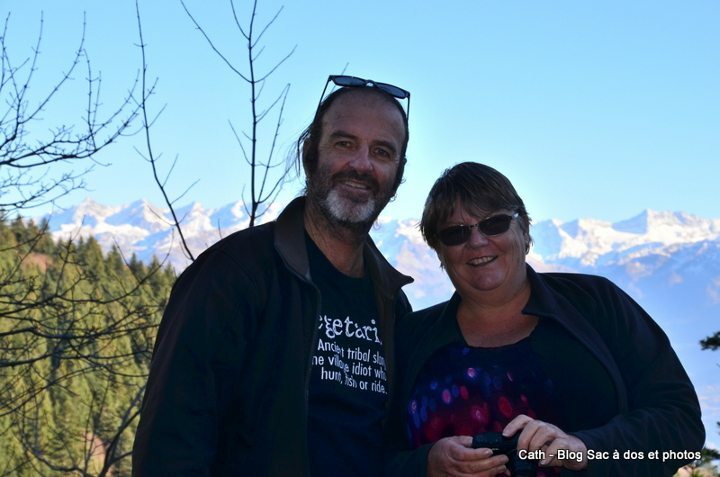 He told us how he was run down by a truck in Thailand and wound up in hospital with a spinal injury. It was pretty amazing that 14 months later he was here in Turkey pedaling up the road. Like us he’d been battling the mistal over the last week but today the wind had shifted so riding wasn’t too bad. After saying goodbye we headed off thinking “just when you think you’re an international traveler someone comes along to bring you back to earth”. lol. 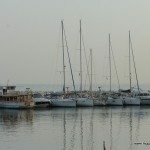 The ride down the peninsula offered us great views of the Aegean Sea and Sea of Marmara. 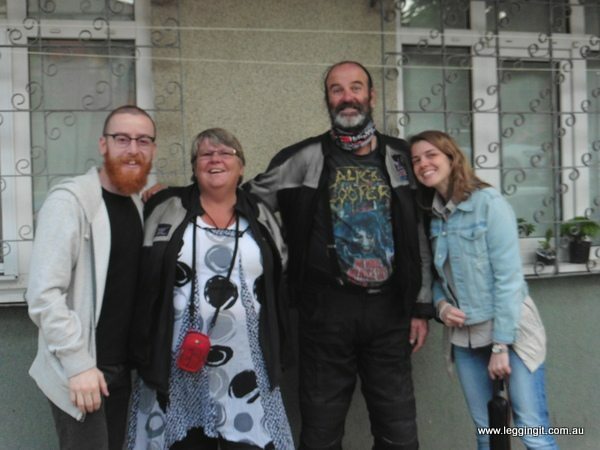 As we headed along the edge of the Sea of Marmara we tagged onto a two guys on a Aprilla 850 cc. It was nice travelling behind a local who knew the road and where to slow down for speed traps. We hoofed along at a fairly decent clip and when I hit reserve I found a petrol station to fill up so waved goodbye. Whilst filling up they returned and also fuelled up. Although we couldn’t speak Turkish we still told a bit of our story and they theirs. They both worked at Net Motors, a motorcycle shop in Istanbul, and had taken a run down the peninsula. Now they were on their way back. The Aprilla 850 they were riding was a nice bike and certainly had a bit of grunt. After shouting us a cuppa they wished us well as we departed. They caught up to us just as we reached our next break on a sandy beach overlooking the Sea of Marmara and waved as they headed past. Heading into Istanbul was a nightmare. The satnav had gone flat and we were navigating using a large scale map of Turkey. 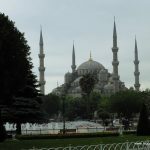 We followed the road around past the airport, past Eminönü and back into the heart of the city. People were tooting (no tooting doesn’t sound aggressive enough). Angry frustrated drivers were blasting their horns for any reason. The light didn’t change fast enough, you were in their way when they were trying to cut you off, somebody else blasted their horn so they tough they’d join in. They even blasted their horns for legitimate reasons too. With the heat reflecting off the city streets it just intensified the rage. Eventually we pulled off the street and brought up google maps on the iPhone. It confirmed we were on the right road and pointed us towards the Bosphorus Bridge. As we approached the bridge a guy on a scooter pulled alongside us and asked us where we were headed. He didn’t understand our English so we said “Izmir” which of course is on the other side of the bridge and he simply said follow me. Well he headed off at full steam down the edge of the traffic weaving in and out of the safety posts with us right on his hammer. With him guiding us we simply cut through the traffic like a hot knife through butter. Soon we’d cleared the traffic and were crossing the bridge. We didn’t have an electronic tag so were expecting a pay booth it when we reached the other side of the bridge we simply rode through the gates. Seeing our exit we waved and peeled off. What a nice bloke to help us out like that. After a little detour we were soon riding through Üshküdar and looking for our couchsurf. Our host Ghan met us and after his wife, Daygu arrived home we all sat down for dinner. 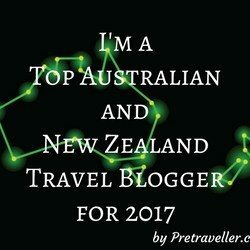 We talked late into the night about their travels to Australia and how he got to travel on the Ghan from Darwin to Adelaide just by flashing his tattoo. But that’s another story. With some advice from Ghan we’ve planned a bit of an itinerary for the next three days in Istanbul, but first some sleep.